Welcome to Gina & Doug's Journey - Join Us on Our Adventure! 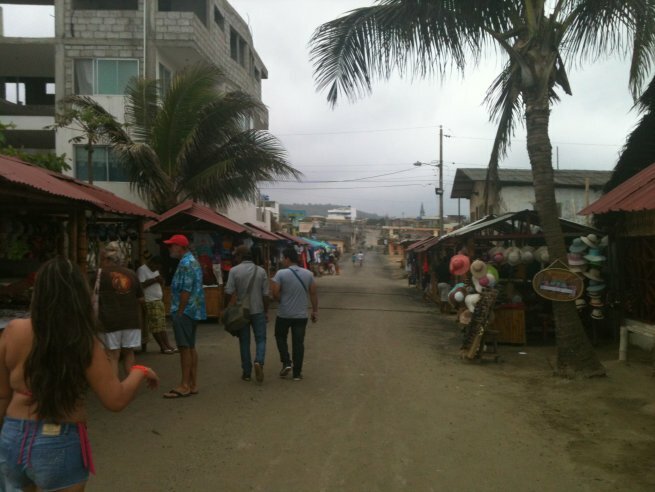 To see photos from current Ecuador trip, click here! We are headed back to Ecuador (finally) on Thursday, January 11, 2018.
up to Puerto Cayo - our final destination! 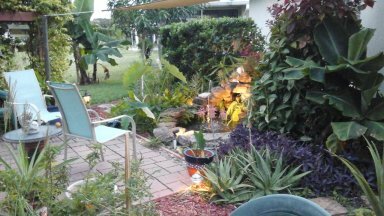 This journey all started with the landscaping projects at Gina's house in Titusville, Florida - turning a subdivision lot into a tropical paradise! 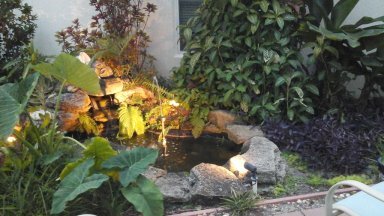 We built the pond that Gina always wanted - complete with lighting to enjoy our little "zen garden" at all hours! 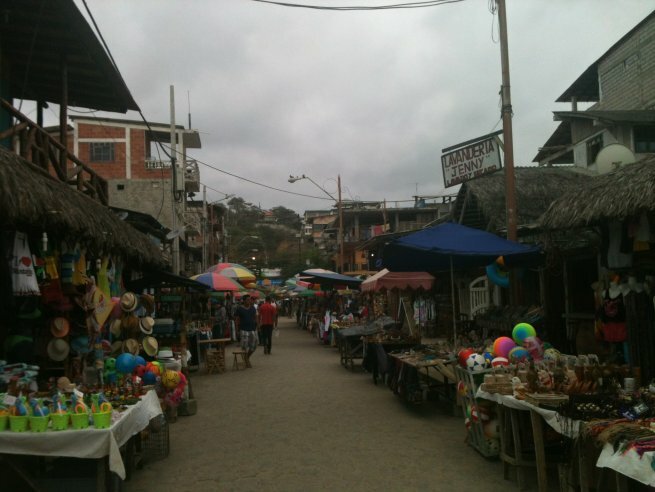 Then came a "chance comment" from Gina's Colombian sister-in-law, that although she loves living in the U.S., "the cost of living is so much less in Colombia or Ecuador". . . little did she realize the wheels that started turning in Gina's head! 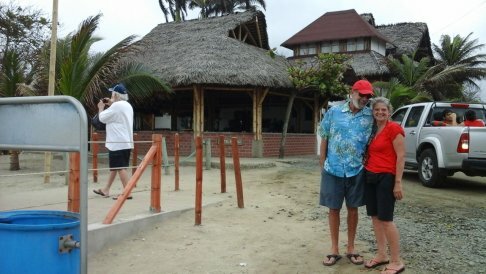 And after much online research on Ecuador, Gina and Doug decided to visit the country, and try it out firsthand. . . 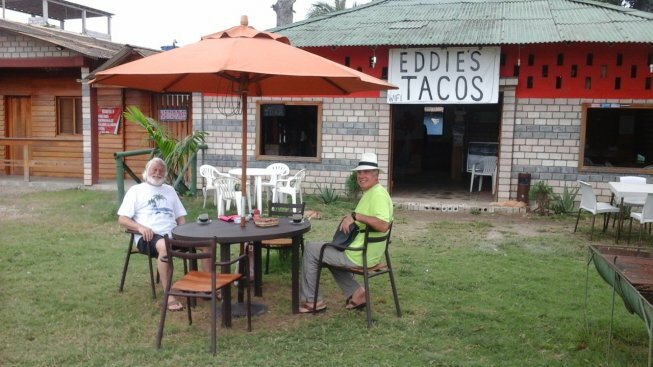 So, in November of 2015, we decided to celebrate our birthdays (Nov 4 & 7) in Ecuador! We flew from Orlando into Ecuador's largest city - Guayaquil. 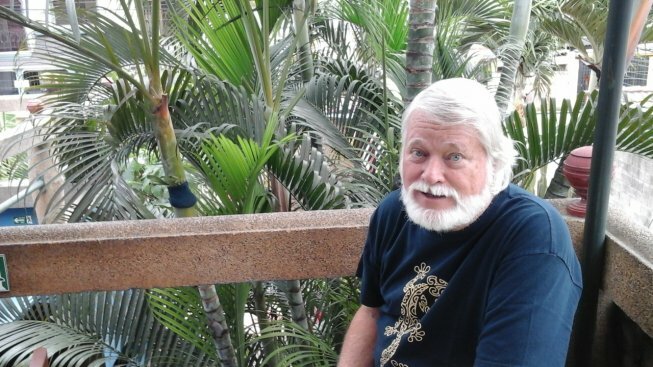 Found a great little hotel near the airport, The Dreamkapture, before continuing our journey to the Pacific coast (here's Doug at breakfast our first morning there). Above, the busy city of Guayaquil - on a walk to the nearby mall to get a local cell phone. What an experience, but that's a whole story by itself. However, cell service in Ecuador is first rate, and fairly inexpensive! 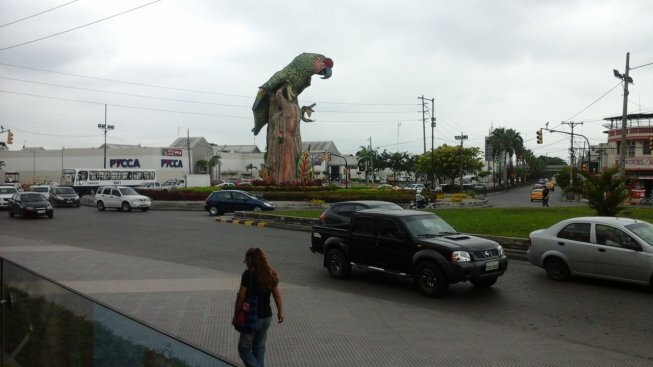 Yes, that's a giant loro (parrot) statue in the roundabout. Visit Tripadvisor for more info on Guayaquil, click here. After an approximate 3-1/2 hour bus ride from Guayaquil (fare = $6/each! 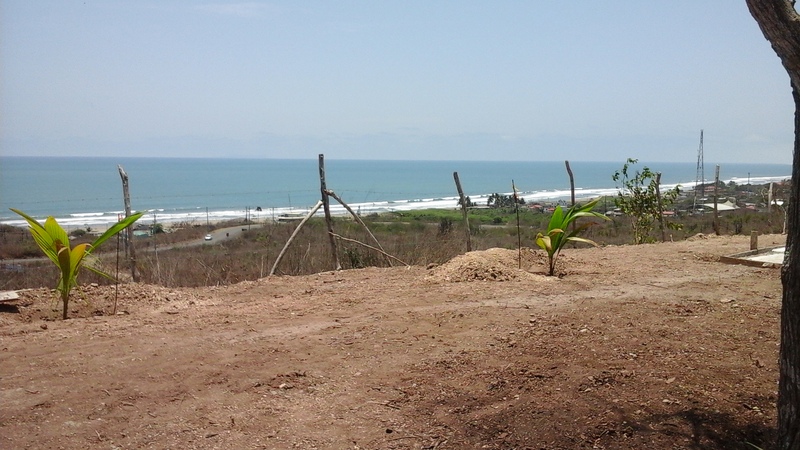 ), we reached the surfer's paradise of Ecuador - Montanita! Known internationally for their annual surf festival (in February, I believe), it is a small town full of people from all over the world - and a real Party Town! Yes, time for a cerveza, oceanside. . . la vida es buena (life is good)! 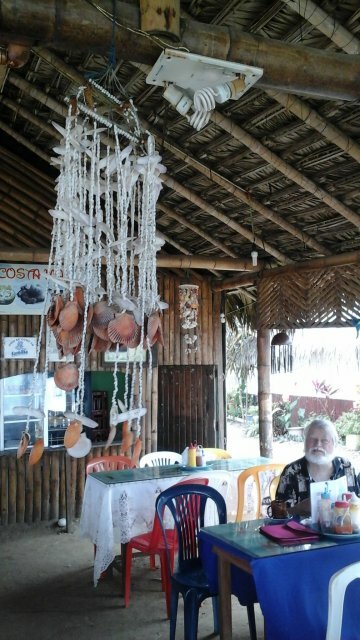 For more info on Montanita, click here. Several blocks from Eddie's on the ocean, is the Sea Garden Inn, where we spent several nights. This photo was taken from the balcony right outside our room. Rodolfo cooked us a lunch one day of some fresh Snook he had, and it was some of the best fish ever! 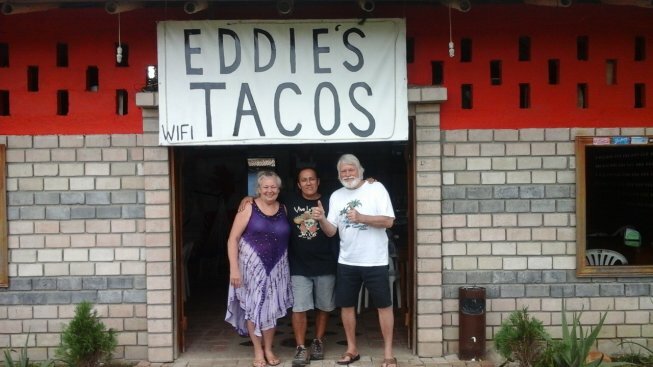 Gina and Doug with Eddie - yes, we were "regulars"! For more info on Olon, click here. Then it was on to Puerto Cayo...after a scenic taxi ride up the coast from Olon, through Puerto Lopez, we arrived in Puerto Cayo. We walked the beach, and stopped to talk with some fishermen launching their boats for their night of fishing. 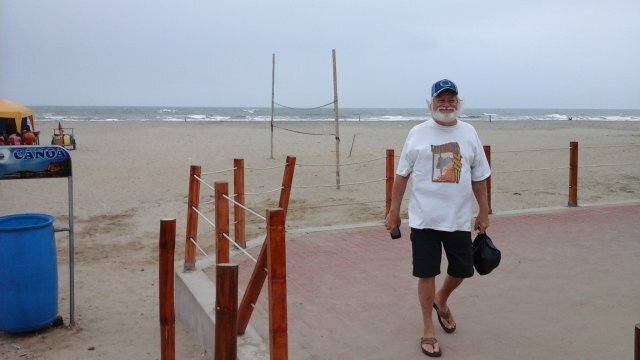 After speaking in Spanish to the two or three men we encountered, we realized that the one who "looked most like a fisherman" (hip boots, etc.) must have spoken only Quichua - as the younger guy spoke to him, then translated the answer to my question to me in Spanish! Cool! 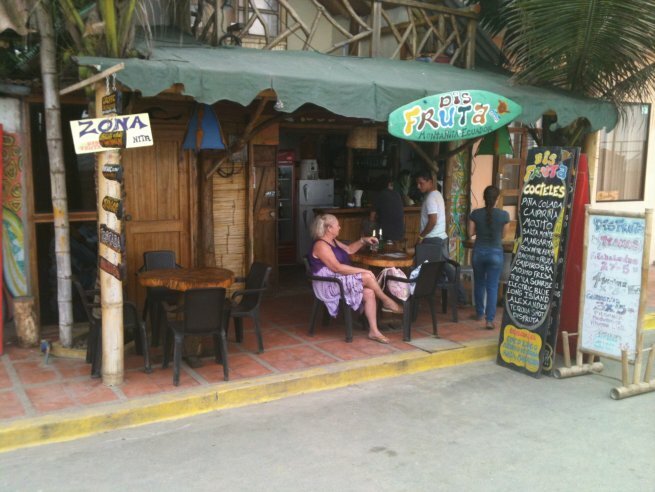 The next morning we walked across the street to the small cabana restaurants on the beach for breakfast. What a treat - to eat a delicious breakfast in the ocean air. 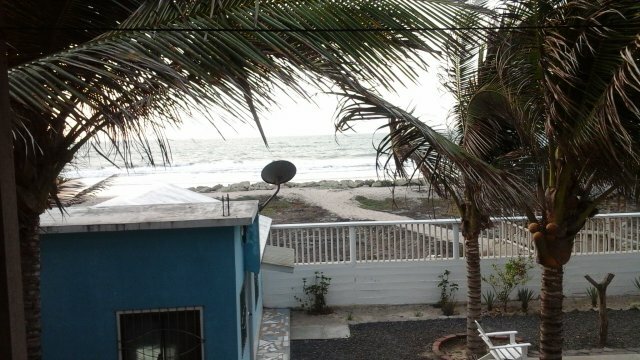 For more info on Puerto Cayo, click here. After a "very interesting" bus ride to Manta from Puerto Cayo - by way of Jipijapa - yeah, that's another "story"... we caught another bus on to Crucita. There we met our realtor Kim, with her husband Ken (whom we now consider friends), who drove us up to La Boca to the Cabanas Vistamar where we would spend a few days. From the balcony outside our room at Vistamar... great B&B, run by a super couple - Oswaldo (who is Ecuadorian), and his wife Guirlene (originally from New York), took care of all our needs. Breakfast delivered to our balcony each morning. Fantastic! For more info on Crucita, click here. 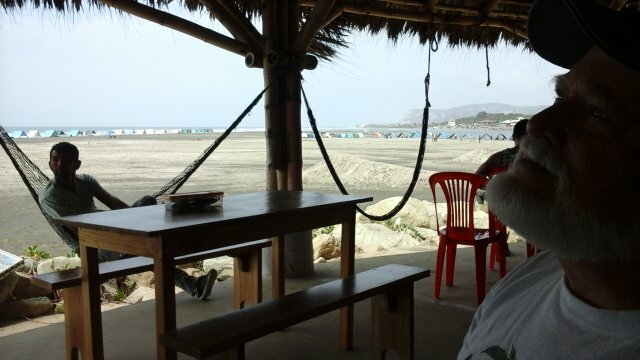 Ken & Kim drove us up to Canoa to look at several properties. 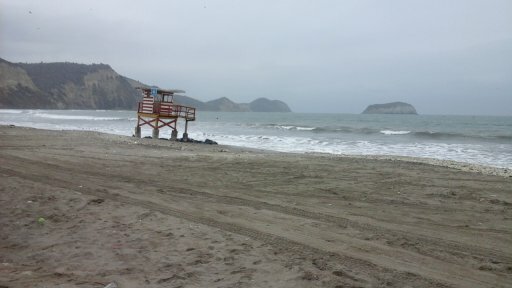 This great little town, also famous for it's great surf, was heavily damaged during the April 2016 earthquake - so we're anxious to get back there to see what it's like now. 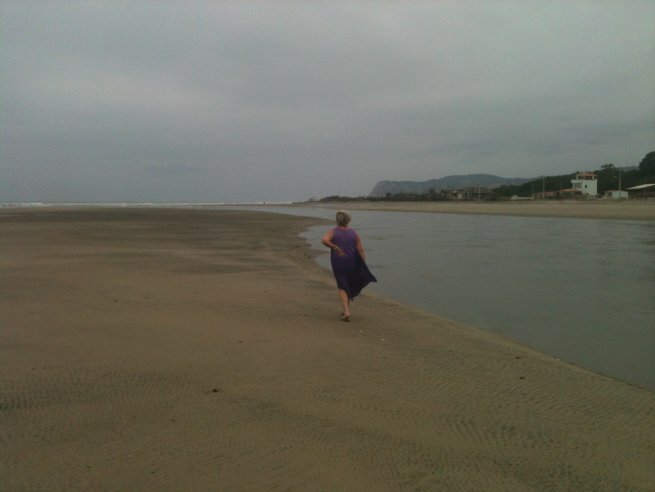 For more info on Canoa, click here. 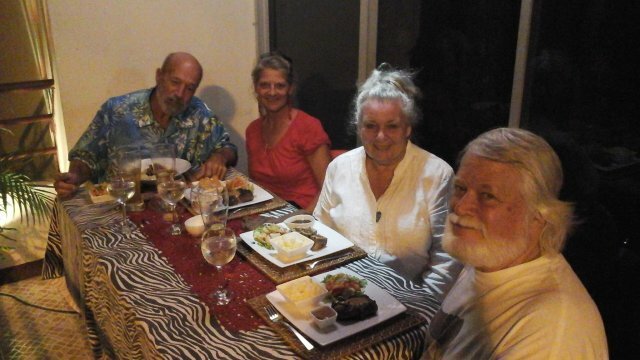 Since this was my birthday (Nov 7, with Doug's b'day on Nov 4th), we had planned a celebration dinner at HJ Grill in Bahia de Caraquez, a small city south of Canoa. Los Caras bridge spanning the Rio Chone is a recent infrastructure project, and is the longest bridge in Ecuador. 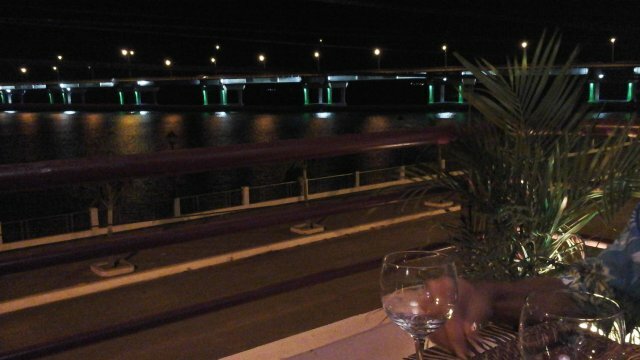 Overlooking the bridge/river is a great restaurant located in the home of the Peruvian chef, Chef Hugo. The four of us had a fantastic dinner, seated on the balcony, at an unbelievable price! 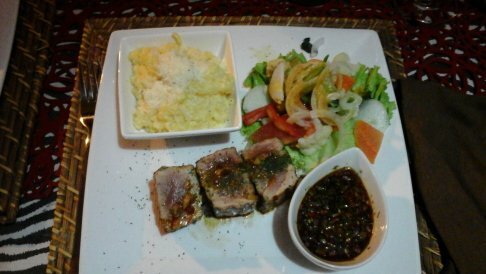 Fresh Albacore Tuna filets - at least 2" thick - with risotto and salad. $15! 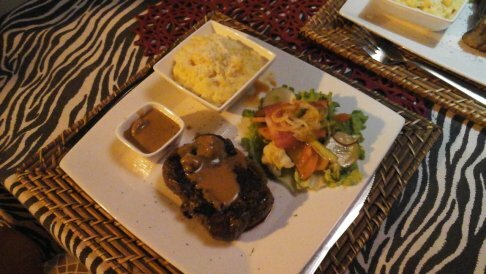 Filet Mignon, also with risotto and salad... would you believe?... also only $15! This was truly a meal to remember. Also found out that the following week was Kim's birthday - so this was a celebration for three Scorpios. Visit HJ Gourmet & Grill on Tripadvisor, click here. For more info on Bahia, click here. NOW, this is what brought us to this part of Ecuador! 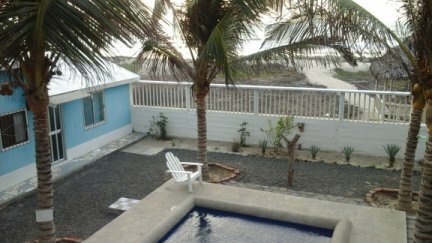 When we found this brand new beachfront house listed online for $149,000 USD - we had to see for ourselves! 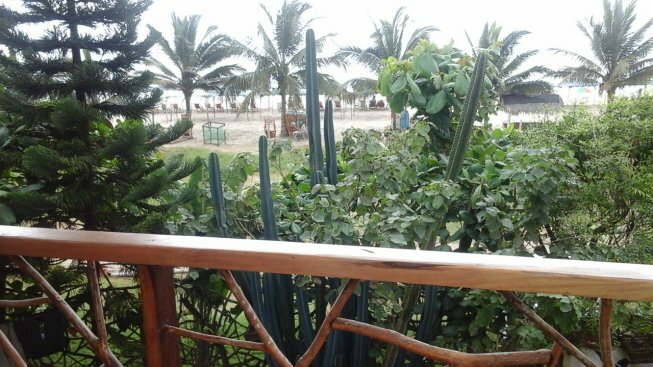 And - it's true - beach property is still actually affordable in this South America country. Approx. 1,500 sq ft, 3 bed/2-1/2 bath, granite countertops, all custom handmade cabinets and doors, fully tiled baths, and a 360 degree rooftop terrace on the third level! Try to find this in any other country! Kim and Gina on the rooftop terrace with Christina who built and owns the home. Her husband is a woodworker who built all the woodwork (doors, cabinets, etc.) in the house. And, what a view! We also found out while we were there that she reduced the price of the house to $114k!... but sorry - at that price, it sold quite quickly! But there are still very affordable properties available. 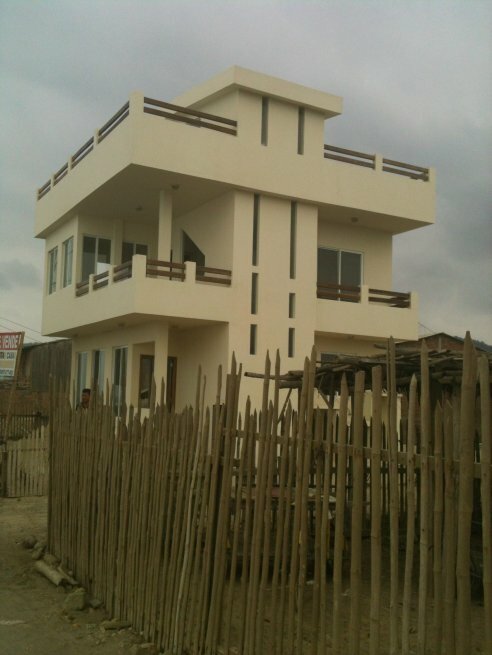 For floorplan and photos of the interior, click here. For more info on the San Clemente/San Alejo/San Jacinto area, click here. Next - Preparations for International Move?